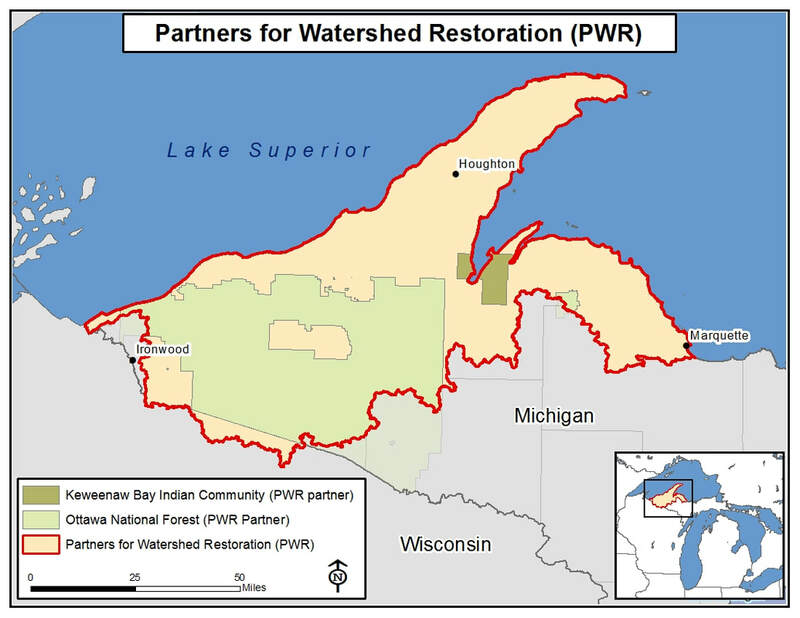 The Partners for Watershed Restoration (PWR) group is a collaborative effort of Federal, Tribal, State and local agencies, academic institutions, non-profits, citizen groups and industry to accelerate watershed restoration through sharing information and pursuing projects of shared interest throughout the central and western Upper Peninsula. A steering committee for PWR was formed in April, 2013, and included the Superior Watershed Partnership, the US Forest Service, The Trust for Public Land, the US Fish and Wildlife Service, and the Keweenaw Bay Indian Community. The initial goal of the committee was to plan and facilitate a one-time workshop to discuss watershed threats affecting the western and central Upper Peninsula as outlined in the Lake Superior Lakewide Action Management Plan (LAMP). The first workshop was held at the Ottawa National Forest’s Black River Harbor Recreation Area in July of 2013 and was attended by over 50 people, representing 23 organizations. Interactive polling software was used to promote conversation and encourage responses to topics of shared concerns, including threats to our watersheds, restoration work underway, funding opportunities and ideas for future cooperation. Due to strong interest from the initial workshop participants, additional workshops were scheduled biannually to sustain dialogue, deliver trainings, and collaborate on projects of mutual interest to promote and accelerate watershed restoration. Currently, over 200 individuals, representing 62 organizations, have participated in PWR workshops. Member organizations recognize that the power of PWR is our collective ability to share resources to accelerate restoration. While this effort involves many stakeholders representing a variety of public and private organizations and interests, PWR has maintained its focus on promoting and implementing collaborative watershed restoration projects. This focused vision provides PWR members the ability to work collaboratively with parties across boundaries and combines our individual organization networks into a pooled, shared network of potential collaborators. One project recently completed which originated from the PWR group is the collection and analysis of road stream crossings leading to the creation of a regional, road-stream crossing geodatabase. This project was led by the Keweenaw Bay Indian Community and utilizes data collected from 11 PWR partners. This sharing and aggregation of data provides a regional tool to assist local organizations when prioritizing where restoration work is most needed and will provide the most benefit. Numerous restoration projects have been completed and many more are either underway or being planned (see Projects section) Additional workshops, trainings and events of mutual interest are in development (see News section for current opportunities). ​If you or your organization are interested in joining or learning more about the PWR group, please contact Jeff Koch.